Avast, me matey! Pay no heed to those glaring land-lovers. Your soul belongs to the sea and your fellow buccaneers. Let all see that you are a pirate through and through. The Jolly Roger Buckle Belt serves as a token of loyalty. 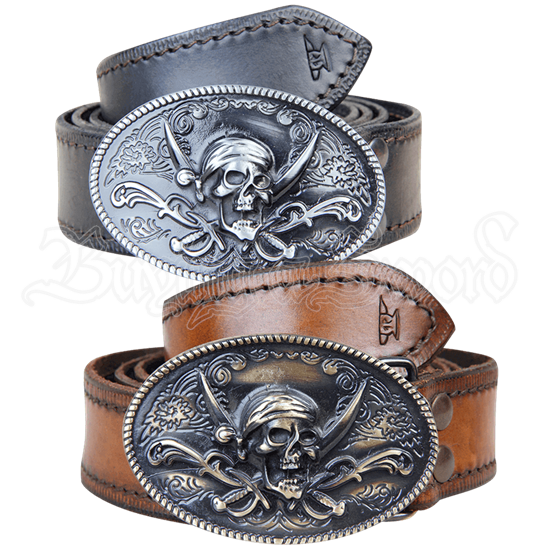 This collectible buckle belt features an oval clasp decorated in a fiendish pirate theme. A fierce skull with kerchief and lethal sabers give a twist to the Jolly Roger motif. Fit this belt to your comfort by adding your own punch holes. A thick thorn on the underside of the clasp ensures a secure hold around the waist. Carry the mark of the seafaring brotherhood wherever the tides may lead. A devoted swashbuckler like you deserves to wear this dashing pirate belt.